Alice Durrant (12) tells us what she thought of Imberhorne school’s production of The Wizard of Oz at Chequer Mead last week. 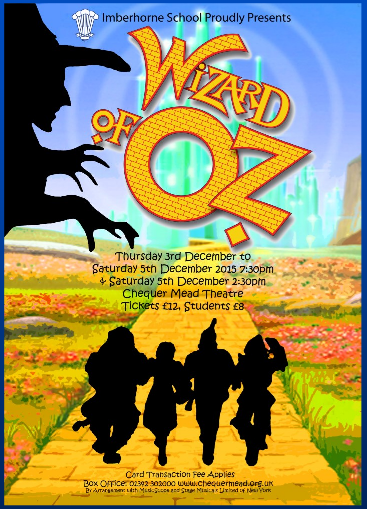 AS some of you may know, in the last few days Imberhorne students have been singing, dancing and acting their hearts out at Chequer Mead Theatre for their school production of The Wizard of Oz. There were four performances with Jasmine Barraclough and Grace Dougan sharing the role of Dorothy. The performance that I saw was on Saturday evening with Grace Dougan. Grace played her part excellently and amazed the audience with her West-End worthy performance of Somewhere over the Rainbow with Finn Devrey’s adorable performance of Toto adding the occasional woof here and there. Another one to look out for in future musicals is Sam Tutty who was made for the part of the Scarecrow. His performance was completely believable and hilarious. He even added an extra bit of comedy when he experienced an embarrassing wardrobe malfunction after a quick outfit change. Olivia Marshall and Tom Clark also blew the audience away with their performances as the Cowardly Lion and the Tin-Man – and their extraordinary acting skills. Sophie Saunders-Griffiths and Bethany Whitaker playing Glinda and the Wicked Witch of the West were just the right amount of good and evil accordingly. And of course you can’t forgot the chorus who made the show with their enthusiasm and energy especially in the Jitterbug number which was a personal favourite of mine. All in all it was another excellent school production from Imberhorne with everyone playing their parts to the very best of their ability, which was overall amazing.